C Read the article again and use information and your own ideas to write notes on this chart. When you have finished, choose one side and argue your case with your partner. 1 cheap fast food 2 etc. 1 small farmers can’t live because of big companies 2 etc. 5a What can you see in these pictures? What do you think the people are doing? 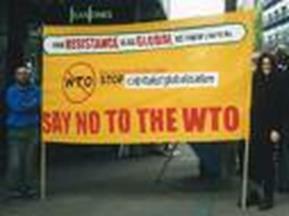 What is WTO? 5b Listen to the talk about globalisation process and tick the phrases you hear. Track 16. 5c Listen again and fill in the missing words. 1 Technological developments have made and travel much easier, so that the world seems to be a smaller place. 2 There are also aspects of the globalisation process – such as the increasing use of English and the appearance of similar (often American) products. 3 And also the fact that you’ve got common brands that are on in many different parts of the world. 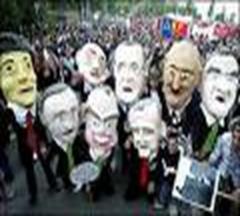 4 And that the process of globalisation is a process in which, if you like, some countries win and others . 5 These include brands such as Coca-Cola and Nike … and - with a slogan “One World: One Taste” - the American fast-food chain McDonald’s.